As a massive blizzard enveloped the Northeast U.S. (and delayed this edition of The Rollup), a blizzard of rumors swept the iOSphere about iPhone 6. There were "reports" from such sources as a "friend at a supplier" in Apple's supply chain about seeing not one but two new iPhones, one with a bigger-than-4-inch screen. There was actually some informed speculation on how Apple might achieve that without disrupting its ecosystem for iOS apps. Because Samsung is rumored to be introducing "5G" Wi-Fi in its next Galaxy S smartphone, it logically follows that Apple will, too. And finally some sound advice for Apple on how to make the 2013 holiday sales of the Next iPhone even more successful: reduce the number of days that people can buy it. CNET was one tech site that noticed, or noticed other tech sites noticing, a Chinese language blog post that declared that both the iPhone 5S and the 5-inch iPhone 6 "have shown up at an Apple supplier in China," writes CNET's Steven Musil. "The models could be released this year, according to a post by a Sina Tech user called Old Yao," Musil writes. "He reports that a friend of his at a supplier has seen the models and says that the iPhone 5S resembles the iPhone 5, while the iPhone 6 is wider, longer, and thinner." "CNET has contacted Apple for comment and will update this report when we learn more." "A buddy from the apple vendor to see will be released this year the iphone 5s and iphone iphone 5s iphone 5 is said to almost the iphone 6 changes, screen should be Wucun, than crazy five wider, longer, thinner, lighter, just people not to take pictures, otherwise everyone to share." We move from the ridiculous to the genuinely speculative. Apple watchers, Rene Ritchie at iMore, and Marco Arment, creator of Instapaper, at Marco.org, recently and separately put together some thoughtful analysis on how Apple could actually create a larger-screen phone. Essentially, they've asked the question, "If Apple did decide to create a 5-inch iPhone, how could they do it, what would the trade-offs be, and which design option would they be most likely to use?" 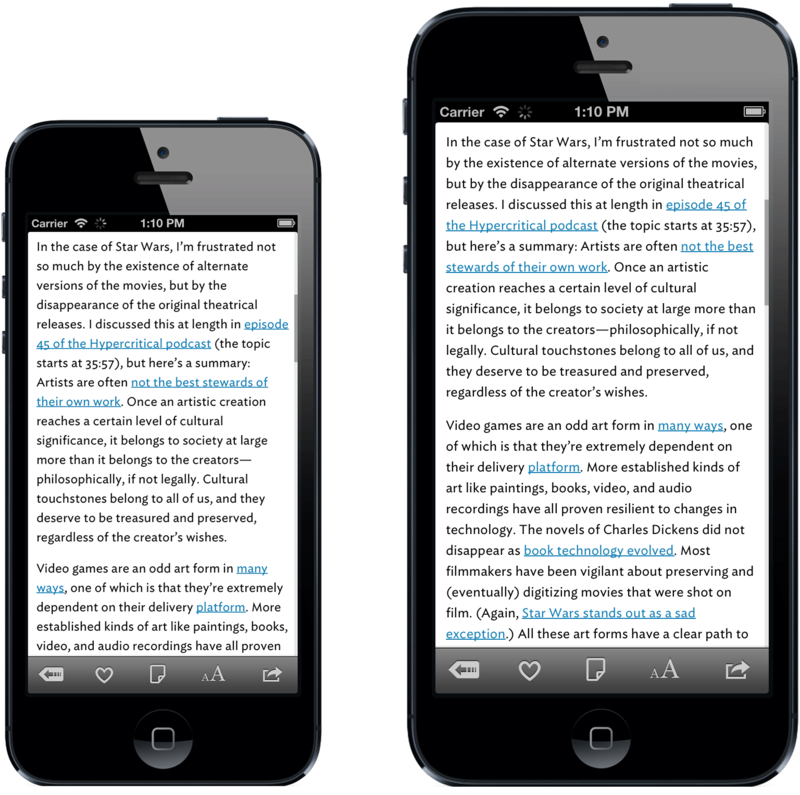 Ritchie's most recent commentary on this, "More on a 5-inch iPhone and scaling the interface," reiterates his point that "stretching the screen" of the iPhone 5 offers the simplest way to create a big-screened iPhone. "If you think of the iPad mini as a tablet that's using phone [pixel] density, then the big iPhone is just a phone using tablet [pixel] density," he writes. "[The result is that] you have phone interface at high density, phone interface at less-high density, tablet interface at high density, tablet interface at less-high density." "Then, just like there's an 11- and 13-inch MacBook Air, and a 13- and 15-inch MacBook Pro, there's a 4- and 5-inch iPhone, and a 7.9 and 9.7-inch iPad," he writes. Here's iMore's mockup of how the iPhone lineup would look. From right: the 5-inch "iPhone maxi," the 4-inch iPhone 5, iPhone 4, and at far left, the original iPhone. Arment argues along similar lines in his blog post "A crazier prediction: iPhone Plus is real, and huge." "The iPad Mini uses iPhone 3GS-density screens at iPad resolution," he notes. "What if an iPhone Plus used Retina iPad screens with iPhone 5 resolution, keeping the rest of the design sized like an iPhone 5?" By "keeping the rest of the design sized like an iPhone 5," Arment seems to mean that the iPhone Plus would appear to be "an iPhone 5 that's proportionally larger." The Plus would have the iPhone 5's resolution and the retina iPad's pixel density. The screen size would measure 4.94 inches diagonally, Arment says. He created a Photoshop rendering comparing iPhone 5 and iPhone Plus. "By keeping the pixel dimensions the same as the iPhone 5, no app changes would be necessary," Arment writes, underscoring what is probably a vital concern for Apple. "While the larger screen would hinder one-handed use, two-handed use would actually be easier because the touch targets would all be larger, and UIKit's standard metrics and controls still work well at that physical size." The UIKit framework provides the classes needed to build and manage an iOS application's user interface. Why or whether Apple would create a larger phone remains an open question. Ritchie uses some hard data to create a useful perspective for answering it. "Almost 9 out of 10 AT&T customers bought 4-inch or smaller iPhones last quarter rather than all big screen Android and Windows Phones combined, and roughly 6 out of 10 Verizon customers did the same," he writes. "So aside from geeks who keep posting about how they really want it, and shoppers for whom bigger as a feature is always better, Apple might not feel any pressing, mainstream need to add another screen size to the iPhone product line. Yet." iPhone 6 will have Wi-Fi 5G, gigabit baby! And we know this because there are people who are expecting that Samsung's forthcoming Galaxy S IV smartphone will use a Broadcom chip that supports the IEEE 802.11ac standard, which can achieve 1.3Gbps. This expectation "has lead [sic] to speculation" that the Next iPhone will, too. Simple, eh? It's the iOSphere's idea of logic. "News that Samsung's Galaxy S4 smartphone (expected to launch this month) may support 802.11ac, also known as '5G Wi-Fi', has lead [sic] to speculation that Apple's next iPhone could support standard as well," according to Macworld Australia. This "news" apparently is simply a comment, presumably in a Note To Investors, by Evercore Partners stock analyst Patrick Wang. According to Macworld AU, Wang "has said that new connectivity chips from Broadcom are expected to be used in the Samsung's Galaxy S4, and that Apple is also believed to be in talks with Broadcom about new chips for its iPhone 6, as well as the rumoured low-cost iPhone." The passive voice covers a multitude of speculation, guesses and sheer wishful thinking. Macworld AU quotes Wang as saying, "We conducted a series of check that indicate [Broadcom's] combo chip (likely 4335, with 5G Wi-Fi, BT, FM) remains designed into Samsung's forthcoming Galaxy S4." One would give a great deal to be assured that "conducting a series of checks" entailed more than "we searched a bunch of tech rumor websites." But, Wang warns, according to the Macworld post, "that he believes Apple may only use Broadcom's 43342 combo chip, which works on 802.11a/b/g/n, BT, FM networks in its iPhone 6, alternatively dubbed iPhone 5S, with a ramp starting mid-2013." That would be Bad News, because we might have "only" 802.11n on a 2013 iPhone instead of "5G Gigabit Smoking Awesome" 11ac. Yet for the initial 11ac-equipped smartphones, the chips, including Broadcom's BRC4335 supposedly destined for the Next Galaxy S, will only support one data stream. Assuming it can find an 11ac access point or router to connect with, and get an 80MHz-wide channel, and 256 QAM modulation, and it's not sharing the air with other 11ac clients, it might realize a throughput of 300Mbps. Which, no doubt about it, is pretty good. Broadcom announced its 11ac chip lineup in January 2012, with a battery of chip products supporting one to three spatial streams, targeted at different classes of products (access points, routers, PCs, smartphones, tablets, embedded devices); some of the chips, called "combo chips," also support Bluetooth 4.0 and/or FM radio. The BCM4335 11ac chip announced last July and "expected" in the next Galaxy S is one such "combo" chip. It's due to ship in volume in Q1 2013 -- any time now. AnandTech's Brian Klug noted in July that the BCM4335 that the BCM4335 "includes a number of the optional 802.11ac features including 256QAM, short guard interval, beamforming, low density parity check (LDPC), and space-time block coding (STBC). This results in a PHY rate of 433.3 Mbps [actual throughput as mentioned above would be about 300Mbps] with 80 MHz channels on 802.11ac." Though still in the process of being ratified formally by the IEEE, the 11ac standard is for all practical purposes finalized. The Wi-Fi Alliance will start interoperability testing and certification of 11ac products this spring. That could be soon enough for Apple to introduce it in an iPhone later this year. But Apple didn't rush into LTE: The iPhone 5 in fall of 2012 was the first iPhone model to support it. So while there's little doubt that Apple is evaluating 11ac, there's somewhat more doubt about when it might introduce it to the iPhone. iPhone 6 will be released in November? If Apple wants to succeed with the Next iPhone, it "might have better luck waiting until the very end of the year to announce its newest iPhone, rather than follow Apple's new 11-month release cycle that might see a new iPhone in September, or even August." That's the contention of Dave Smith, writing for International Business Times (IBT). Let's assume there is logic at work here. "Last year, the iPhone 5 took product hype to a new level," Smith asserts. "Unfortunately, despite people talking about this unknown device for more than a full 12 months, introducing the device only seemed to dampen excitement surrounding Apple." Wait. The iPhone 5 was introduced and it dampened excitement? Could this be the same iPhone 5 that set all-time sales records, and drove all-time revenue records, in Apple's first quarter? The same iPhone that, as iMore's Rene Ritchie pointed out above, "almost 9 out of 10 AT&T customers bought ... and roughly 6 out of 10 Verizon customers [also bought] ..."? "The iPhone 5 has been a very successful product for Apple," Smith admits, somewhat confusingly. So it didn't dampen excitement? "[B]ut the company needs to reenergize its fan base if it hopes to outdo its iPhone 5 sales with the 2013 iPhone." Yet every iPhone model has been significantly more successful than the previous model, suggesting that the "fan base" is has been increasingly energized. "To feed the hype machine, Apple should wait for a longer-than-normal period to release the iPhone 6," Smith concludes. Specifically, without hashing the entire 2007-2012 history of Apple's iPhone release dates yet again, Smith believes that the way for Apple to even more successful with the Next iPhone is to delay releasing it until November 2013. In other words, Apple will sell more iPhones during the holiday season by selling them for a shorter holiday season. That seems, shall we say, counterintuitive. But, according to Smith, by releasing iPhone 5 in late September 2012, "customers were left more time to choose between Apple's latest iPhone and all other smartphones released during that time." So, logically, by releasing iPhone 6 in November or possibly even December, buyers would have less time to choose between iPhone 6 and ... uh ... all the other phones that still could be released between September and December. "If Apple wants the iPhone 6 to be its best-selling smartphone ever, the company needs to release the phone closer to the Christmas holiday," Smith blithely asserts, repeating his insight that shortening the holiday buying season for the Next iPhone would result in higher sales. Somehow. Perhaps he's counting on the Frenzy Factor in buying, which results in the by-now-expected Black Friday shopping riots, visible in this handy YouTube compilation for 2012 or one of the free-for-alls for the latest Air Jordan basketball shoe.